Painted Oval Bentwoood Box . 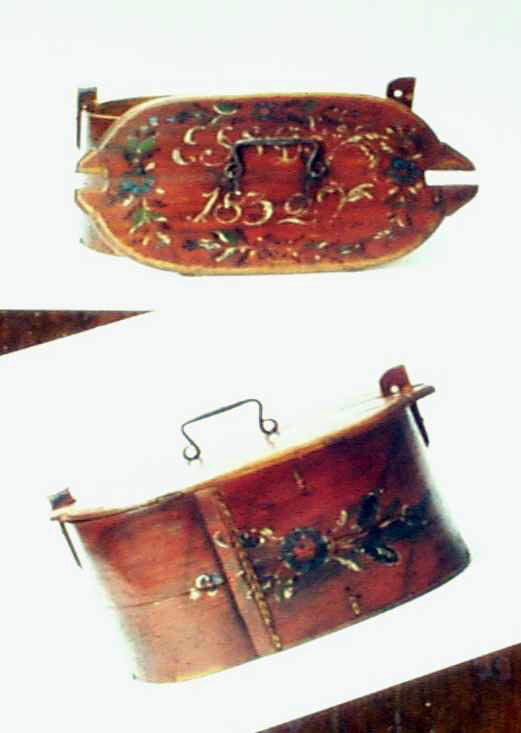 . . Called a "Tina", these were used for carrying personal items, storing valuables, and functioned similarly to our modern purses. Oval box in bentwood construction, the sides meet in a lapped joint sewn with a wooden "with" or rawhide thong. The lid is cut to fit carved posts that are pegged to the sides. Excellent original painted surface. Top is initialed and dated 1832. Size is 15" long x 8-1/2" wide x 7-1/4" high.